For some, being on vacation is more than just relaxing indoors. It's about exploring and experiencing everything there is to offer. Head outside and take in the fresh country air while you participate in one or all of our extensive outdoor amenities. Whether you enjoy the camaraderie of a friendly match, the quiet escape of a relaxing hike or lazy day by the swimming pool, we offer and assortment of things to do for all energy levels. Whether you're looking to beat the heat with a refreshing dip or soak up the sunshine, the outdoor swimming pool is a great place to spend your summer days. Enjoy splashing with the kids or explore the underwater depths of the deep end. Plenty of shaded areas are available surrounding the pool offering a comfortable spot to enjoy a good book or an afternoon snooze. 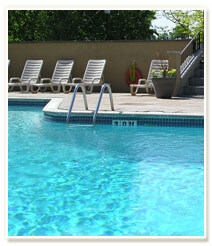 The outdoor pool is open daily from 8am to 8pm - weather permitting. Change rooms with showers and washroom facilities are available pool side for guest convenience. Pool side service is available 11am to 5pm from Canada Day to Labour Day allowing you to quench your thirst and satisfy your hunger without leaving the sun. 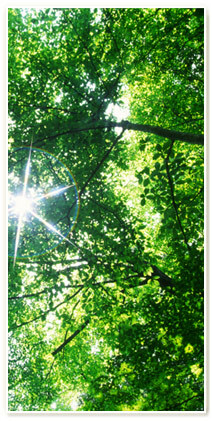 Geocaching is a treasure hunting game where you use a GPS to hide and seek containers hidden around and among the beautiful grounds of the resort. Available on long weekends, players use a GPS device to located and record where the waterproof containers called "geocaches" are located. Geocaching isn't just a way to explore nature, have fun, and be active — it's also a fantastic way to spend time together as a family! GPS units are available to rent for $11.25. Please visit the Sports & LeisureDome for more information. 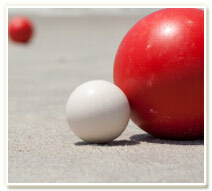 A perfect pastime for a sunny day, the game of Bocce ball is suited for players of all ages. Bocce ball, an ancient game which most closely resembles bowling, involves a skilled hand and the right amount of strategy. Bocce is played between two players or two teams of up to four players on a team. The Bocce ball court is located alongside the tranquil pond and is a short stroll from the hotel. Please visit the Sports & LeisureDome to pick up Bocce balls. The volleyball court, located beside the soccer field, is a great pastime for mixed groups of all ages and skill levels. Ideal for large groups, you should have at least six players on two teams for a true game, but any number will do for a recreational game. Whether you're learning the basics or engaging in a friendly competitive match, volleyball is an excellent way to enjoy the outdoors while having fun with friends and family. 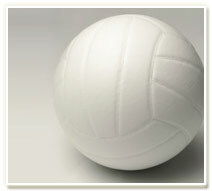 Please visit the Sports & LeisureDome to pick up a volleyball. There are few things as relaxing as the warm glow of a fire on an evening. 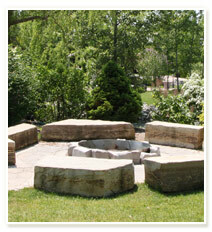 The outdoor fire pit, located beside the pond, offers circular seating for 25 people upon natural Canadian Glacier Cap Rock and is a perfect way to end your day. Gather together and roast marshmallows, share stories, or sing your favourite campfire songs. Enjoy the opportunity to meet other families and couples staying at the resort at our complimentary bonfire available on long weekends throughout the summer. Please inquire at the Sports & LeisureDome for bonfire times or to reserve the space for a private function. 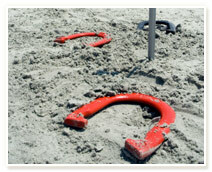 Gather together your friends and family and enjoy a fun and competitive game of horseshoes. The horseshoe pit, located on the grounds by the playground, is a classic lawn game best suited for two or four players. Visit the helpful staff at the Sports & LeisureDome desk to pick-up your horseshoes. Enjoy the beautiful outdoors while you let the kids run around and blow off some steam at the outdoor playground. Located beside the Centre Ice Sportsplex arena, the outdoor playground offers parents and children a safe space to play freely in. 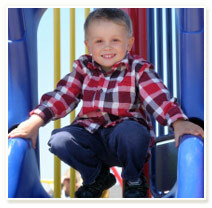 A variety of challenging climbers, slides and interactive stations provide both an entertaining and educational space. Climb the rock wall, win a game of X's and O's or hold an impromptu meeting under the walkway, because being a kid means that the possibilities are as big as their imagination. Experience the quiet tranquility of the countryside while enjoying a stroll on our two beautiful nature trails. Lining the winding Nottawasaga River, the trails offer walkers, joggers, bird-watchers and snowshoers an opportunity to enjoy the splendour of nature. Each path begins at the first hole of the Valley golf course. The gently winding paths lead you alongside the manicured golf greens treating you to a picturesque landscape of mature cedar trees and various native varieties of plants and flowers. The Valley Trail is an easy 2.8 kilometre limestone trail that is best suited for a quick recreation hike or a leisurely stroll. Comfortable benches line the trail offering a space to rest on and enjoy the beautiful scenery. The Briar Hill Trail is a moderate 3.5 kilometres roundtrip trail with a more challenging terrain. A winding path of gravel and limestone travels along several elevation changes, proving to be an excellent trail for hiking.